Malformed log messages can cause performance issues, which can affect SSB functions like searching or reporting. The following error messages from local logspace may indicate malformed log messages. SSB collects statistics and metrics about the messages received and delivered. Malformed log messages produce incorrect statistics which may cause performance issues. The most significant symptom of a malformed log is the incorrect "Program" field. To check for such program names, execute the following command in the CORE shell. Any unknown or strange program name indicate malformed logs. The easiest way to find mispared logs is to use the Search interface of SSB. From Syslog-ng statistics it is not possible to tell in which logspace the logs are. Therefore all logspaces have to be checked one by one. f. Find an incorrect program name in the list and click on it to add it as a search expression. See example incorrect program name examples marked on above image. g. Click 'Search' to show the log messages with the selected program name. Check the logs to find out the sender host. Basically there are 3 options. a. The "Host" field shows the original sender host. b. The "Host" field shows a relay host. Check the log message itself for clues to identify the original sender host or application. c. The "Host" field shows an incorrect or unknown host. Basically there are two kinds of root cause of a misparsed log. Cause: The client sends the logs in incorrect syslog format. Solution: Check the sender host and configure the log format corresponding to the format configured in the SSB source. Cause: The client sends the logs in a non-syslog format. 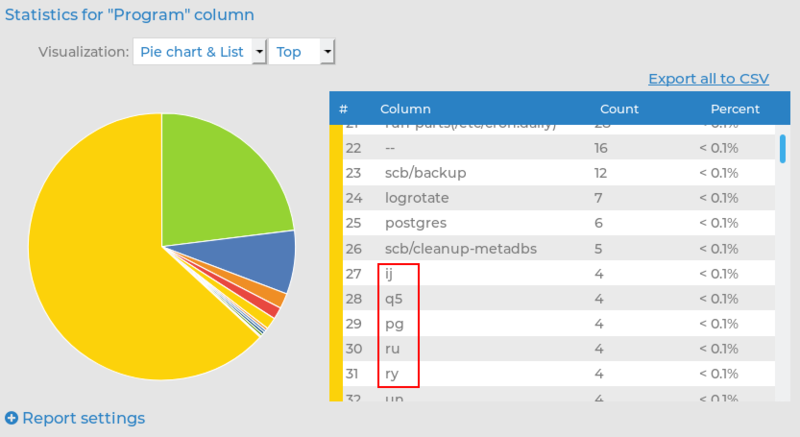 Solution: Select "Do not parse" Syslog flag in SSB source where the logs are received. If there is a syslog-ng relay before the SSB use flags(no-parse) option in the source configuration.